Hello everyone! I can’t believe it, but it is STAMPtember already! I am so excited! And thankful, too. Even though I have plenty of stamps and dies in my stash I’m always looking for new goodies to play with. This is just our human nature, I guess. Always wanting new things lol! I combined a few new products to create this card. I used a lovely birch tree window die and created a window in my card base, I used woodgrain cardstock for my card and it looks so nice with that die cut design (I added a layer of light gray paper to the inside to make die cut design pop). The images, gnomes from the Secret Garden set and flowers from the Oh Happy Day set, were stamped in VersaFine Onyx Black ink onto watercolor paper and colored using Distress inks (I am listing the colors below). I also used matching dies and cut all of these out. 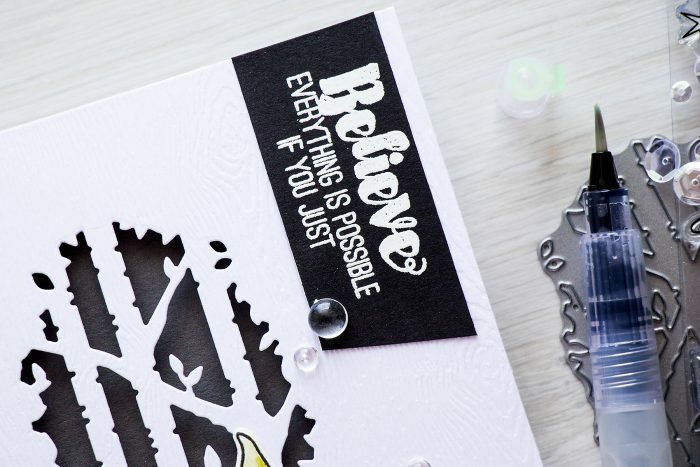 My sentiment came from the Secret Garden stamp set and was heat embossed in White embossing powder onto black cardstock strip. 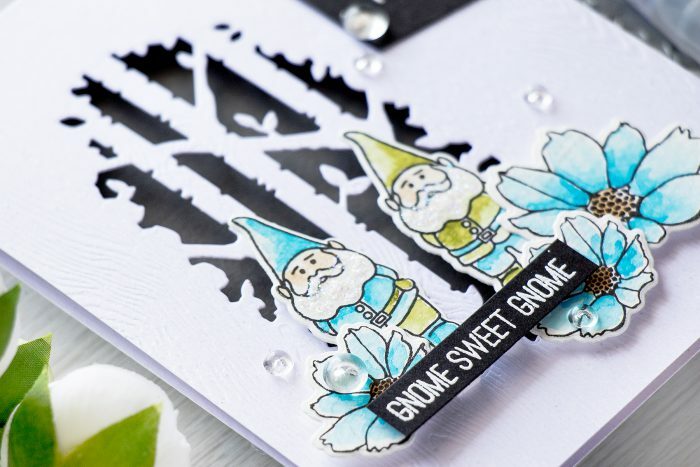 I added a bit of clear glitter to the beard of my gnomes for a fun look and also adhered several clear droplets to complete this card. Happy Stamptember! It’s so exciting! Your card is incredible. So clean and crisp. Love color combo if blue and olive. thank you, darling 🙂 I’ve been enjoying this color combo lately, very new to me. Very nice card. The Gnome sentiment puts a smile on my face. Love your card! Super cute card Yana. Isn’t this an amazing release? Oh my goodness ALL these yummy sets and glitter paper & envelopes too….Swoon…What’s not to love??? it absolutely is! thank you! This is gorgeous – thank you for sharing your talents! what a cute card! my wish list is growing! Such a gorgeous card Yana ! 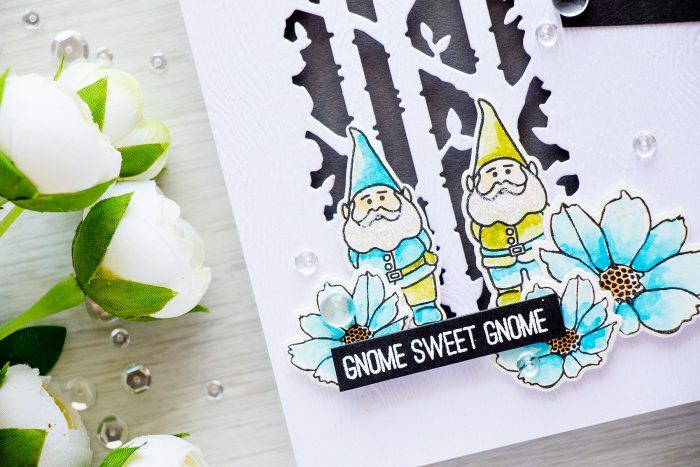 Those sweet gnomes make me feel in Snow White ! 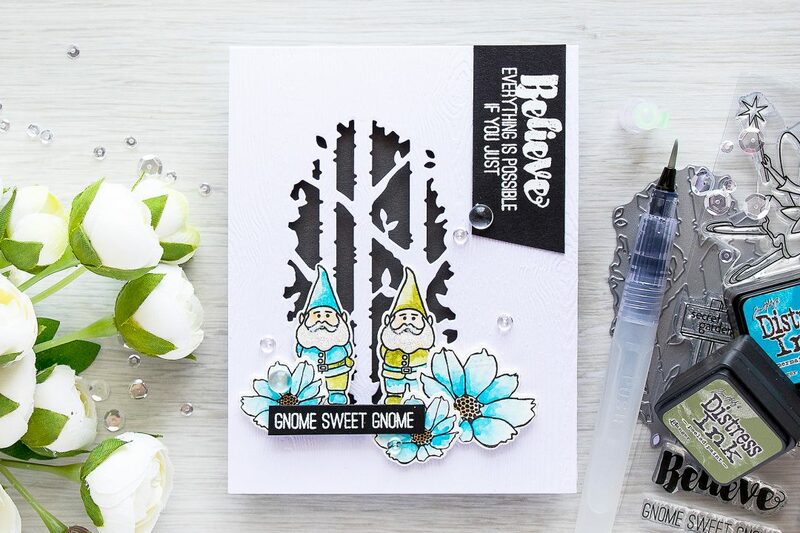 I love this new Birch tree window die, the effect on your card is just superb ! Thanks for sharing. Hi Yana, fabulous card – the colours are wonderful as is the colouring. Your cards are beautiful. Thanks for sharing. 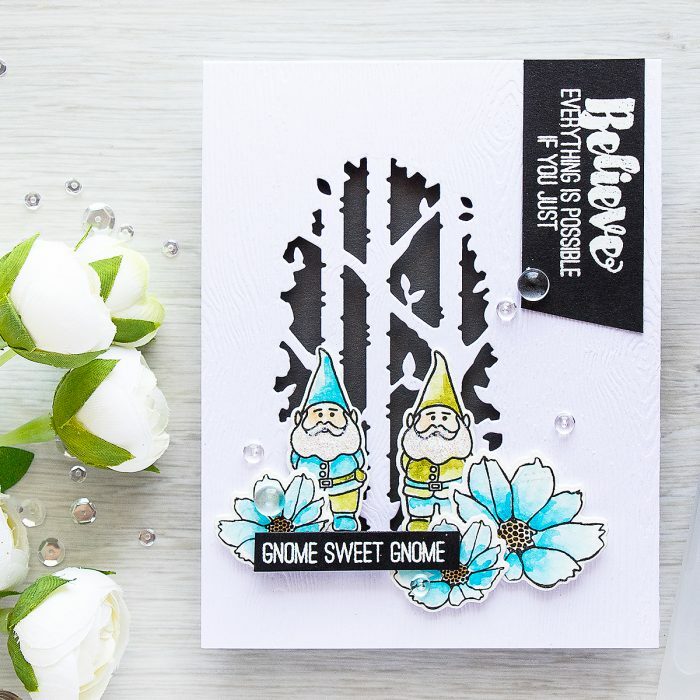 A really cute card….I never would have thought to pair the gnomes with the birch tree die cut. Yana, love your cards all videos, informative, thank you for sharing with us. Thanks for the inspiration! I loved your Merry Christmas card. Thank you for showing us how, if we want, to “fix” small boo boos. I thought it was a beautiful card. Thank you for inspiring us and sharing video and info with us. Loving the gnome card!